We never post for you. Being a new parent is overwhelming; trust us, we know. Your questions are all over the place—which is why we’re here, along with our trusted experts, to help. One of your biggest questions as a new parent is your baby’s sleep patterns. What’s normal? What’s not? When should I be concerned? 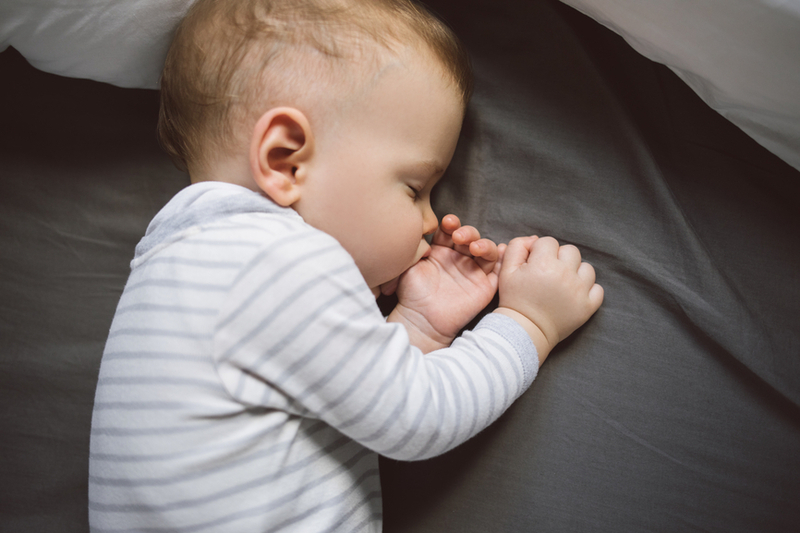 So we spoke with Arielle Driscoll of Sleep Consulting, LLC, to get some info on the factors are affecting your baby’s sleep for the first 18 months of her life, and what you can do about it. Arielle says, “It’s important to remember that sleep does not exist in isolation from everything else happening developmentally with your child.” Physical and cognitive growth can disrupt sleep, as can illness, mastery of physical milestones, and nap transition periods, among other things. So let’s start off on the things affecting your child’s sleep, and what you can do about them. Early on, your baby’s sleep schedule will be affected by their feeding schedule. It’s not that your infant is necessarily hungrier at night; it’s that infants’ small stomachs can’t handle much food at each feeding, so they need to feed often, which is why they tend to wake frequently to get the calories they need. Once your baby passes the 4-month mark, you can start to tweak their feeding schedule. Stick with the same number of feeds, including night feeds, but try to offer more calories during the day to prevent the need to eat more in the night. So your baby waking during his or her first 4 months at these stages is normal. And the general rule of thumb for a baby over the age of 4 months is to stay consistent with her schedule through the growth spurts—you shouldn’t see any disruption due to growth spurts alone. Some babies are extremely sensitive to leaps, while others are not. Typical signs of leaps include disrupted sleep, eating more or less, crying and fussing more, and acting clingy. Some will show signs with each leap; others may only show signs during a few. In our experience, Leaps 5,8,9, and 10 are the hardest on sleep. Your best plan of action is to stay consistent with your child’s sleep schedule and power through. First thing’s first: you need to remember that each baby reaches her physical milestones when she’s ready Don’t compare your baby to others (we know, it’s hard!) and don’t worry unless your doctor is concerned. In general, the biggest physical milestone that affects sleep is crawling. (You can read more about the science behind this here.) Walking can also affect your baby’s sleep. Your child may have refuse naps or take only short naps, have early wakeups, or even some middle-of-the-night wakings. This is all normal. Again, it is best to stay the course with your child’s sleep schedule. If by this age you’ve used a formal method of sleep training, use whatever method you used originally to power through this time period. It’s always best to consult your pediatrician about night feeding. As is true for everything else baby-related, each child’s individual situation has its own considerations. Many babies can sleep through the night without a night feeding by 6 months, while some babies may require a night feed through 9 months or longer. You can address night weaning by using a formal sleep training method, or by dropping the number of ounces in her bottle by one ounce every other night until there’s no longer a bottle. Alternatively, if you’re nursing, you would decrease the amount of time you’re nursing by one minute each night until you’re no longer night nursing. You may experience some sleep disruptions around nap transition times. This is normal. Your baby’s sleep needs change as she gets older, and adjusting to one fewer nap per day can be tricky. *The average age for the 2-to-1 nap transition is 15 months. Some parents may mistake leaps or physical milestone sleep disruption for the need to transition to one nap. We do not recommend rushing the 2-to-1 nap transition. The best advice we can give during these nap transition times is to compensate with an earlier bedtime as your child transitions. Early bedtimes help prevent your baby from becoming overtired.